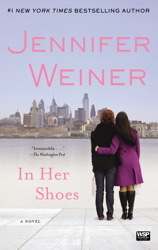 Another really enjoyable book by Jennifer. Rose and Maggie are as different as night and day, yet they do have one thing in common. Their DNA. Rose is practical, bookish and serious. Maggie, is thinks only of herself and her looks, is selfish and has a learning disorder that she has used to keep herself back her whole life. When they get into the biggest fight of their lives they find out more about themselves then they ever had, and learn that by having a few of your sisters better traits really is a good thing.